Victorian two bedroom property set over three floors in sought after Huntingdon town centre location short walk to shops, restaurants and Huntingdon bus and rail links. Accommodation comprises lounge, kitchen, two bedrooms and bathroom. The property also benefits from an enclosed courtyard. The property is an excellent opportunity for investment. 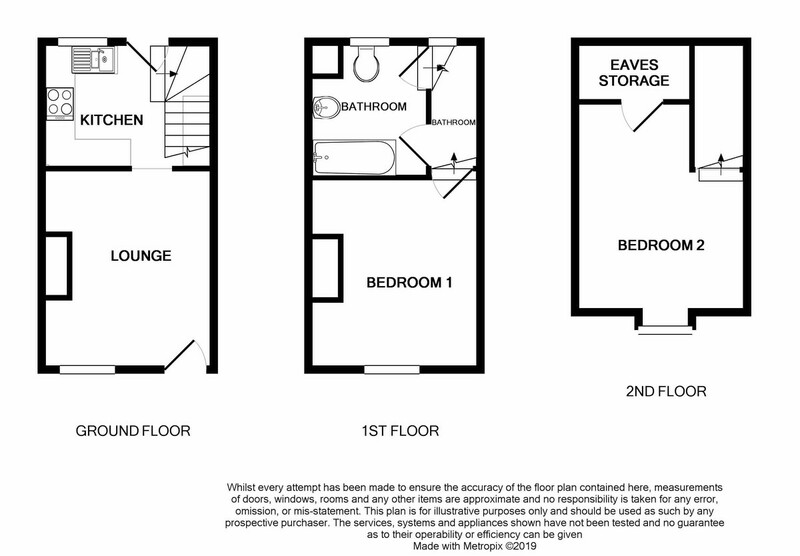 The property is an excellent opportunity for investment or for first time buyers. Call to book your viewing! KITCHEN 10' 3" x 7' 4" (3.12m x 2.24m) Double glazed door and window to courtyard garden, fitted with a matching range of wall and base level units with work surface over, inset one and a half bowl stainless steel sink and drainer unit, built in oven with electric hob and extractor over, space for under counter fridge, tiled splash backs, stairs leading to first floor. BEDROOM ONE 11' 9" x 10' 2" (3.58m x 3.1m) Double glazed window to front, radiator. BATHROOM Double glazed window to rear, fitted with a matching three piece suite comprising panelled bath, close coupled WC and pedestal wash hand basin, radiator, cupboard housing wall mounted gas fired boiler. stairs leading to second floor. BEDROOM TWO 13' 5" x 10' 3" (4.09m x 3.12m) Double glazed dormer window to front, access to loft spaces, radiator. REAR COURTYARD GARDEN The courtyard area is paved with two storage cupboards, one of the cupboard has space and plumbing for a washing machine. Gated access to rear. AGENTS NOTE The vendor informs us there is a right of way for the neighbours to take the bins out to the end of the terrace across the back of the property. Curious to find out what your property is worth? Are you looking to sell a property? Are you looking for a local estate agency offering a professional package to market your property and gain the greatest possible exposure? Whether you’re serious about moving or just curious to find out the value of your home, WellingtonWise has a team of experienced property valuers ready to offer you expert advice. Find out why we’re the leading Estate Agent in your area by booking an appointment today.